More than half of children and teens in the United States are not getting adequate hydration, most likely because they're just not drinking enough water, according to a new study from the Harvard T.H. Chan School of Public Health. The statistic is worrisome, researchers say, because inadequate hydration can have significant effects on children's physical and mental health. "There's a lot of research out there to suggest that even mild levels of dehydration are enough to impact cognitive functioning and mood in kids," lead study author Erica Kenny, a postdoctoral research fellow in the Department of Social and Behavioral Sciences at Harvard's Chan School, told CBS News. While severe and long-term dehydration can lead to serious health problems, effects of mild dehydration can include headaches, dry mouth, dizziness, irritability, increased heart rate, and poorer physical performance. In addition, "We're worried about the impact on the brain and their ability to learn if they're not well hydrated," said Dr. Deborah Lonzer a pediatrician at Cleveland Clinic Children's. The study, published Thursday in the American Journal of Public Health, also found racial and gender disparities in hydration levels. 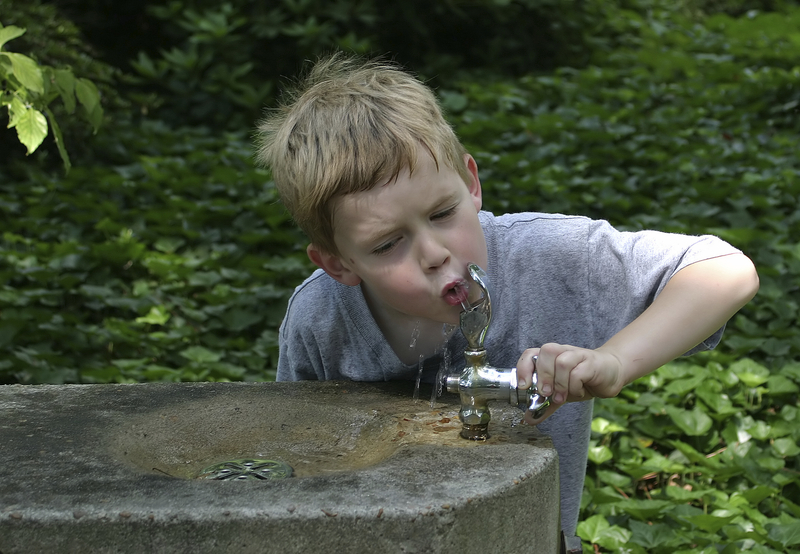 Black youngsters were more likely to be inadequately hydrated than whites. Boys were at a higher risk of inadequate hydration than girls. The researchers examined data from 2009 to 2012 from the National Health and Nutrition Examination Survey, a study of the health of U.S. children and adults conducted each year by the Centers for Disease Control and Prevention. The sample included more than 4,000 children and adolescents aged 6 to 19. Kenny and her team used urine osmolality, a test that measures how concentrated a person's urine is, to determine hydration levels. "Generally, a lower number means that you're pretty well hydrated, and a higher number means that your urine is more concentrated," she said. "It vaguely corresponds with your urine color. When you have really light colored urine, you're well hydrated versus dark urine when it's more concentrated." The results found that a little more than half of all the participants weren't getting sufficient hydration. Boys were 76 percent more likely than girls and blacks were 34 percent more likely than whites to be inadequately hydrated. The researchers also noted that nearly one fourth of the participants reported drinking no plain water at all. Daily fluid intake recommendations are subjective, and depend on a number of factors, including age, gender, weight, activity level, and amount of time spent outside in hot weather. According to Institute of Medicine guidelines, children aged 9 to 13 need to take in between seven to eight cups of fluid per day, while teenagers aged 14 to 18 need between eight and 11 cups. Though these guidelines include fluid content in foods and other beverages, Kenny said drinking water is the best way for kids to stay hydrated. The issue of inadequate hydration among children is both a personal and public health concern, Kenny said. Parents should make sure clean drinking water is available to their kids, especially when they are engaging in physical activity and when they're outside. Schools can also do more to improve access to water and make drinking it seem more appealing - "particularly schools that have really old water fountains that nobody wants to drink out of and those that just don't have enough water fountains for the number of kids that are there," Kenny said. She pointed to recent research that found children's water intake increased by three times after water dispensers were installed in some New York City public schools. "The dispensers look like what you would see at a sandwich shop filled with fruit punch or lemonade," she said, "but they filled them with chilled water and put them on the lunch line to promote water to kids and found that it increased water intake." At home, parents can enhance the taste of plain water by adding fresh lemon, lime and orange slices, Lauren Graf, a registered dietitian who works with pediatric patients at Montefiore Medical Center in New York City, suggested. "Add these fruits to a large pitcher of water and leave in the refrigerator," she said. "The fruit adds a refreshing, subtle hint of flavor but without the sugar." Graf, who frequently helps teenagers with kidney stones, which requires adequate hydration to treat and prevent future cases, said parents should also limit the number of juices and sugary beverages their children drink. "Regular consumption of juice trains the palate to crave sweet beverages and may discourage your child from drinking water as they perceive it as too bland," she said. "Reducing intake of sugary beverages can help retrain the palate to crave less sugar." Finally, something as simple as sending kids to school or a friend's house with a water bottle can go a long way in encouraging kids to hydrate more frequently. "It's all about access," Kenny said. "Just giving children a way to actually get water can be a good thing and promote consumption."